If you are new at Kayaking, you may find it hard to take all your belongings with you on the water. In addition, kayaks have a tendency to capsize. You may run into trouble and need to protect yourself. There are a lot of manufacturers around that cater to these needs, and they work hard to design products that will leave you safer, more protected, and with your belongings on hand. The best manufacturers focus on safety, comfort, and quality. The good news is, that we are trained experts in research and assessment, and we have researched hours on end to create a list top quality life jackets for you. All of our top picks are from manufacturers who specialize in kayaking and fishing safety gear. We’ve compiled the best life jackets available for kayaking and fishing, and we have found some truly amazing jackets. Hopefully, our research will help to keep you safe, comfortable, and enjoying your trips to the fullest. One may even safe your life! We have compiled a comparison table to show you each product’s features right next to each other, making it easy to compare products and pick the one that best for your specific needs! Some things you may want to consider before buying a life jacket, is that you always want to look around first to see what suits you best. I can’t imaging how sick you could have gotten to find out you bought a boring orange “life block”, and not one like the ones we found made just for you. Also we encountered similar complaints on every life jacket we looked at saying that they were too gaudy. Keep in mind before buying a life jacket that the thickness, to a certain extent is a necessary evil. These are flotation devices, so I’m sure they can only get them so small before they lose effectiveness. There are some very thoughtful manufacturers out there, and the life jackets we found are loaded with features for anglers of all types. Just keep in mind how it feels to be out kayaking, and pick one that best suits you! This jacket is specifically built for kayaking, with a net area integrated into the back, that accommodates for a kayak seat, and gives you comfortable fit for your work or play. Comfortable – This jacket will offer shoulder adjustments, ample ventilation, and a sculpted, flexible design.These features are designed to keep you cool, carefree and in control while you are kayaking, allowing unsurpassed comfort and peace of mind. Designed for Paddling – A specially designed mesh backing, and sculpted, flexible design are incorporated for comfort. This provides a full range of mobility, and keeps you unrestricted and in full control. Excellent Safety Features – SOLAS grade reflective material for visibility, attached whistle, and an expandable zippered pocket offer added safety. You will also get a whistle that can come in handy. Above Average Customer Reviews – Ratings on top selling products can usually be affected by negative results. However, the ONYX MoveVent is different. 4.7 is one of the highest ratings we’ve seen on more popular products, you can rest assured you are buying quality with this one. May require some special adjustments for large breasted women. This life jacket was specifically designed for paddling sports. In our opinion, this design is unsurpassed and the top of its class. Grab your ONYX kayaking life jacket in a variety of colors and styles here! The Fisherman Personal jacket by Stohlquist is specifically designed for kayaking. They have incorporated EVA stiffened padded pockets, which allow “over the rim” re-boarding without spilling your belongings. Designed for Kayaking – This jacket has features that will help kayakers keep comfortable, organized, and safe on the water, and in possession of all their belongings. Excellent Quality – The high flotation back is made for kayaking. The cross-chest cinch harness, is fully adjustable, and the pockets with drainage use anti-spill technology that is perfect for kayaking. Ample Pocket Space -7.5 X 7.5 EVA pockets act as fold down work surfaces, and the mounting locations in the pockets are perfect for tools, baits, and more! Comfortable and Unobtrusive – Open sided for ventilation, with a neoprene padded shoulders, and lower back waistband allow for a customized fit. Designed to Cater to the Specific Needs of Kayakers. Some complaints of jacket being too bulky. The Stohlquist Fisherman Personal Floatation Device is as brilliantly thought out design as it gets. This jacket is designed to keep you safe, on the water having fun, and with everything you need with you. Come see what makes the Fisherman Personal so unique! The NRS Chinook Mesh Back Fishing jacket is designed for kayak fishermen. With pockets for tackle, a built-in rod holder, and numerous other well thought out features, the Chinhook has been boasted by fisherman to be an anglers best friend. Designed for Anglers – Aside from the rod holder, the Chinhook Fisherman is perfect for kayak fishermen, with 7 front pockets for all your tackle, tools, and more. Mesh Backing – The mesh back is perfectly designed for high-back seat kayaks, and it keeps you cool in the summer months, and allows for extra maneuverability. A Fully Customizable Fit – A total of 8 customizable adjustment points, allowing a personalized fit, allowing personalized comfort and as much free mobility possible. Soft PlushFIT Foam Floatation – This jacket is designed to snug to your body, offering all day comfort and easy of mobility, and allowing your performance to be uninhibited. Some find the jacket hard to adjust. The Chinhook Mesh Back Fishing PFD is made deliberately to accommodate the kayak fisherman. Designed by a company that was created by a fisherman that knows exactly what you need while you’re out on the water. See how NRS made the kayak fisherman’s life a lot easier! This U.S. Coast Guard Approved Type lll life jacket is designed with safety in the forefront. The ONYX Curve conforms to your body, allowing excellent mobility and comfort as well. Made for Kayaking – With a mesh area in the back that fits high-back seat kayaks, the ONYX Curve is the ideal jacket for kayaking and water activities of all types. Excellent Ventilation – Added ventilation in front and back to keep you cool during the summer months, and a design that adds extra mobility. Designed for Comfort – Soft and lightweight with a sculpted, flexible design that contours to the body for unrestricted performance and all-day comfort. Adjustable and Unobtrusive – Adjustable side belts help you fit the ONYX Curve to your body like a glove, keeping it stay out of the way of your best performance. Designed with kayakers in mind. Made with extra ventilation for summer months. Sculpted and flexible, contouring to the body for comfort. 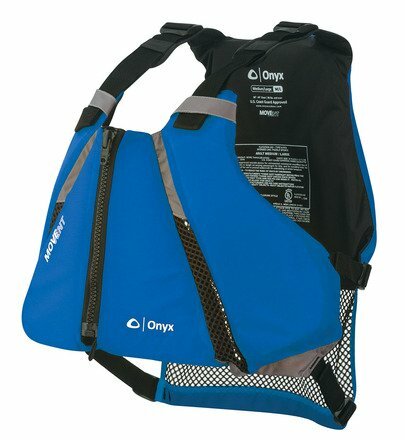 The ONYX MoveVent Curve Paddle Sports Life Vest is the safest and most comfortable option for kayaking. The extra ventilation will be welcome in the summer months, and the contoured soft, yet flexible fit allows full mobility. See why ONYX jackets are perfectly designed for kayakers. 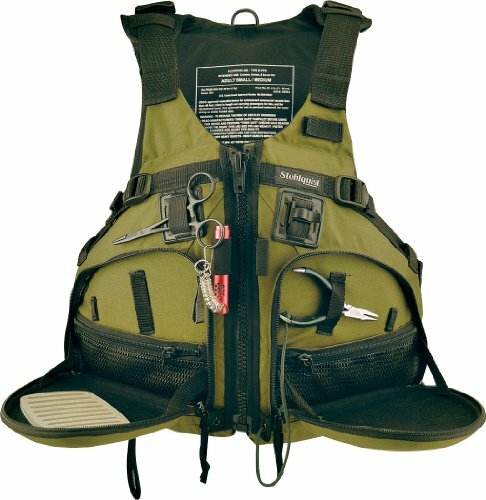 The Coleman Company Stearns Comfort Series Personal Floatation Device is another U.S. Coast Guard Approved life jacket built for comfort, with large arm holes designed for carefree casting, paddling, or aiming. U.S. Coast Guard Approved -This design is safe enough for the Coast Guard, and amply thought out for any novice, keeping you comfortable and safe in your aquatic endeavors. Large Arm Holes – The armholes are larger, specifically designed for hunters, anglers, kayak fisherman, and paddlers of all types, allowing you the freedom you need to be you. Comfortable Mesh Shoulders -Excellent airflow, allowing you to remain cool in the summer months, and adding extra mobility for maximum comfort and performance. Customizable Fit – The webbing adjustments and heavy duty zipper front are designed to hug your body, keeping the jacket as close to you as possible, and allowing safety without a big price to pay. Made for active types and ideal fishermen, hunters, and kayaking. Cool in the summer months with added ventilation. Designed for comfort and all-day performance. Safe, fully adjustable jacket offering personalized comfort. The Coleman Company Stearns Comfort Series jacket will keep you with your mind on your work or play, and make safety and comfort second nature, allowing you to fish, shoot, paddle, or whatever you want to do without something big and bulky getting in your way. See why Coleman flotation devices might be right for you. 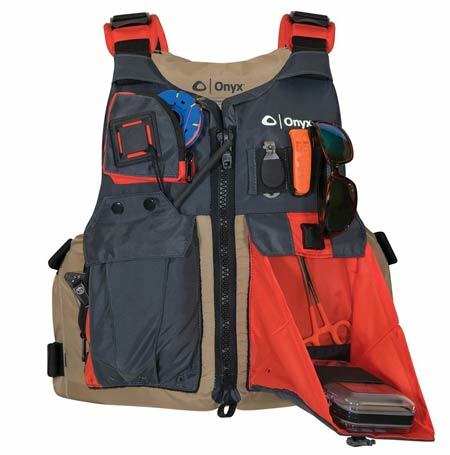 The Onyx Kayak Fishing vest is perfect life jacket for kayaking, fisherman, or any other type of water-related activity due to its numerous pockets, and its special one-touch drop down tray pocket that holds a small tackle box. Special Extra Pockets – This jacket offers a large mouth cargo pocket, a one button tray pocket, zippered fleece lined pockets, and an additional chest pocket to carry gear. Low Profile, Paddle Specific Design – High foam back accommodates high back seats, and the ONYX Kayak Fishing Vest is made to stay out of the way while you are out with mother nature. Full Custom Fit – Six adjustable straps for full custom fit, as well as the low profile, out of the way design meant to hug the body and stay out of your way. Ventilation and Comfort – With a mesh back that allows cooling in the warmer months, you experience all day comfort with an ergonomically designed life jacket. Designed for kayaking and fishing. Stays cool in summer months. Zipper may be hard to start up for some. 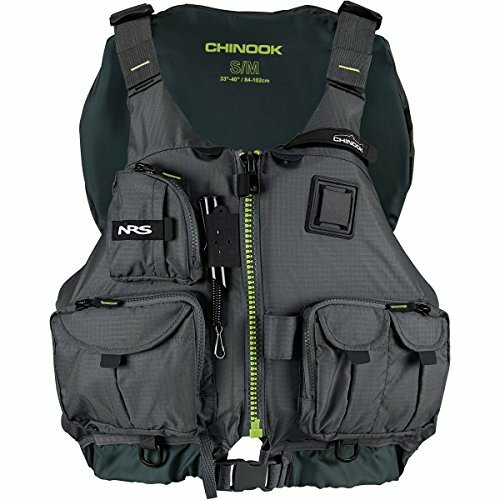 The Onyx Kayak Fishing Vest is designed for kayaking fishermen, adding the addition of ample and specialized pockets for carrying gear, tackle, and other personals or job-specific gear in while you are on the go. Check out this awesome kayaking/fishing jacket! 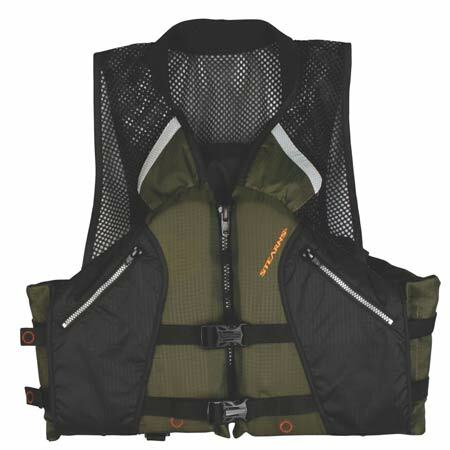 The Stearns Comfort Series Collared Angler Vest is designed to make kayaking and fishing easier. There are additional pockets for storage, and mesh areas that allow added mobility, ventilation, and a cooler body in the hotter months. Convenient Breathable Design – Mesh fabric shoulders create a unique breathable design that feels free, unrestrictive, and even cooling during summer months. Designed for Kayaking and Fishing – Designed with you in mind, there are extra pockets, clips, and hooks to accommodate your tools, gear, net, or any other gear needed by active water sportsman. 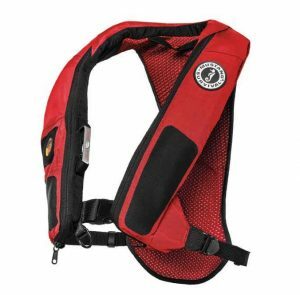 Coast Guard Approved – The PVC/PE flotation foam neoprene collar that prevents chaffing, and 200D nylon shell with adjustable strap design is U.S. Coast Guard approved for safety. Comfortable – This adjustable jacket is designed to stay out of the way until you need it, allowing a carefree experience without distractions. Designed with kayaking and fishing in mind. Extra pockets for gear, keys, and other items. With extra storage, and an ergonomic design that is adjustable, the Stearns Comfort jacket is designed to keep you on the water with your necessities, and out of harm’s way. See what Stearns has made just for the kayakers and fishermen. The Absolute Outdoor Onyx A/M-24 Deluxe Auto/Manual Inflatable Life Jacket is packed with features. Enjoy utility pockets, and a convertible automatic/manual to manual only inflation, providing two totally different experiences for the kayaking or fisherman t stay safe in emergencies. 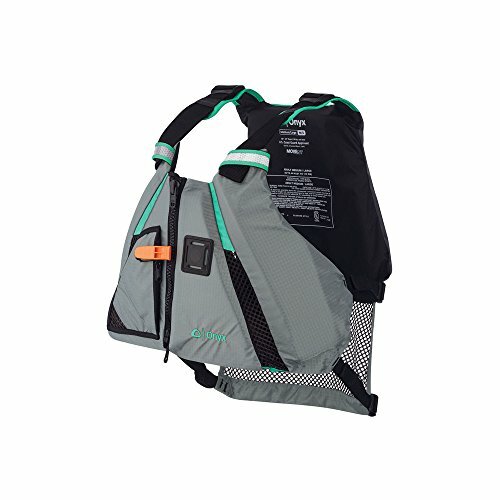 Equipped with Utility Pockets for Storage – Added pockets for gear, keys, phone, or other accessories and needed items make this life jacket ideal for water related outings of all types. Convertible Design – Switch from automatic/manual to manual only inflation in case of emergencies, allowing you to have a backup in case your back up ever decides not too work. Comfortable and Ventilated – This jacket is made to be lightweight, comfortable, and cool while keeping you in your favorite work or play, with everything you need on you. U.S Coast Guard Approved – Coast Guard approved type V life jacket designed with the utmost attention to safety. Another top-quality fisherman’s best friend from ONYX. You may need to read instructions before using the first time. The Absolute Outdoor Onyx Inflatable life jacket is a perfectly though out design for kayakers and fishermen, with ample pockets and a design that keeps you carefree on the water. Check out another ONYX masterpiece done just for you! The Mustang Survival Hydro Elite 38 Inflatable PFD is designed with one thing in mind. Bringing you home safe. This jacket offers a strobe light holder and safety whistle, and also offers a Hydro-static inflator Technology, that only inflates when submerged minimizing accidental inflation. Safe and Innovative – Hydro-static Inflator technology or HIT technology allows you to self-inflate the jacket in any instance that you may be in an emergency situation where you are fully submerged. Lightweight and Comfortable – The lightweight body-armor outer shell, and the Aerodynamic 3D Chassis system allow for a glove like fit, to keep you safe without getting in the way. Great for Emergencies – With a Plus 38lbs buoyancy strobe light, and a safety whistle for added emergency gear, stay safe and have options when life’s “twists” try to turn your way. Superior Safety for Water Activities – Added safety features and innovative survival design make the Mustang Survival Hydro Elite 38 Inflatable PFD the perfect aid in emergency situations. The Mustang Survival Hydro Elite 38 Inflatable PFD is a great option for people who like to think ahead. There are added safety features, adaptations for comfort, and a Hydrostatic Inflator that may save your life one day! Let’s get safe with Mustang’s survival gear! 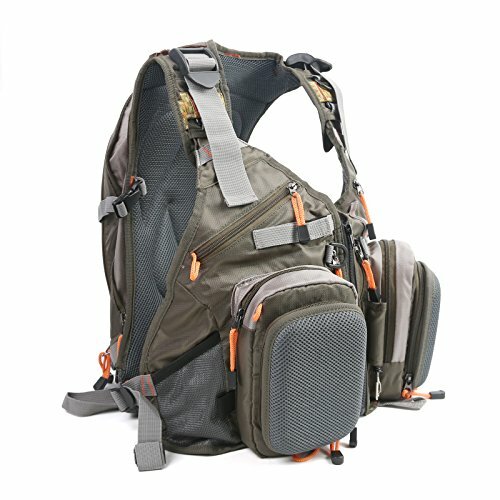 The Maxcatch Fly Fishing Vest Pack is an all-around excellent design. The various sturdy, zippered compartments give you places to put gear and personals, while the rod holder strap makes it ideal for kayak fishing. Designed for Fishermen and Kayaking – With zippered compartments for gear, shell pockets with fly patches, and rod holder straps, this is the ideal life jacket for fishing or kayaking. Adjustable – One size fits all and adjustable design is ideal for outings, because you never have to worry how it will fit. If you gain some weight, no big deal. If your son needs is, no big deal! Lightweight and Comfortable – Designed with all day outings and rigorous activities in mind, this jacket makes the perfect accomplice for fishing or kayaking missions. 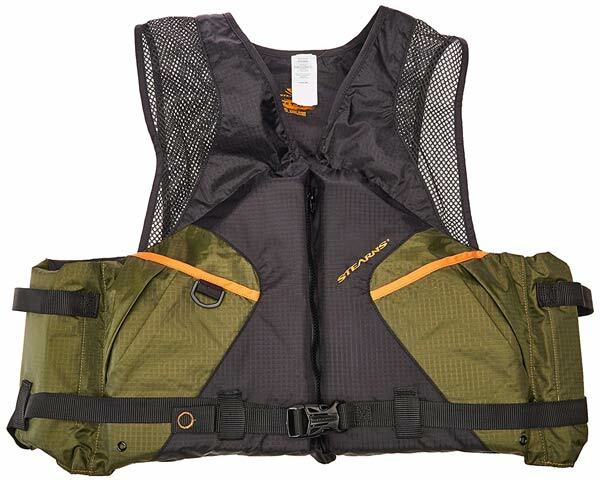 The Maxcatch Fly Fishing Vest is the ideal flotation device for fishermen. With lots of zipper pockets, a rod holder, and a one size fits all, comfortable fit, this jacket will keep you comfortable and in control on your outings. See why we thought this life jacket is unique! We do extensive research before tackling any topic, to make sure that we do not place any incorrect, or unnecessary information online. We research manufacturers, mission statements, warranty information, websites, and blogs. We even watch videos, listen to product experts, and read customer reviews to determine our selections. Life jackets are a must while you are out on the water, and it is crucial to have a life jacket that will do its job! Accidents can happen, which means that life jackets take a unique role compared to other products, because you have to wear them all day just “in case” something happens. In the end, you want something comfortable, with the right materials and time taken to manufacture it. We found some excellent life jackets that are made for kayak fishing! If you were looking for the best life jackets to protect you and your loved ones, we feel the same way… and you have come to the right place! All of the products that made our top 10 list are ranked because they deserve it. Each of the jackets we selected are special in some way to kayak fishing. Each of the manufacturers designing these jackets understands the needs of a person out on the water. Each of the manufacturers designing these jackets understands the needs of a person out on the water. They understand the need for safety and emergency preparedness, as well as the need to carry your belongings with you. In the end only you know your needs exactly, so just pick the one that fits your needs best. Each of the models on our top 10 list will offer something unique to keep you safe, comfortable, prepared, and in possession of your necessities with you on your next kayak fishing trip! Each of the models on our top 10 list will offer something unique to keep you safe, comfortable, prepared, and in possession of your necessities with you on your next kayak fishing trip!